If you’re looking for a quick and easy way to cut down on water usage, adding water-saving aerators to your faucets is an excellent way to do just that. Consider that home and business owners pay for water three times: once to bring it into the building, once to heat it, and once to dispose of it. Think about the number of customers at your restaurant, guests at your hotel, or students at your school, and you’ll realize how expensive water usage can be. Swapping water-saving aerators into your faucets is a simple way to save a lot of money on your utility bills. Aerators work by mixing air into the water stream, thus breaking one large stream of water into multitudes of tiny streams. This means less water coming out of the faucet without sacrificing water pressure. Why Install Aerators in Your Facility’s Faucets? Aerators reduce the amount of water coming out of your faucets, and so your water bills will be lower. Along with being cost-effective, installing water-saving aerators is one of the easiest things you can do to make your home, office, or commercial building more efficient. They can be installed and ready for use in seconds! Adding air into the water stream also helps reduce splashing, and will cut down on wet restroom floors. This can help prevent slip and fall accidents, and make your facility more appealing. 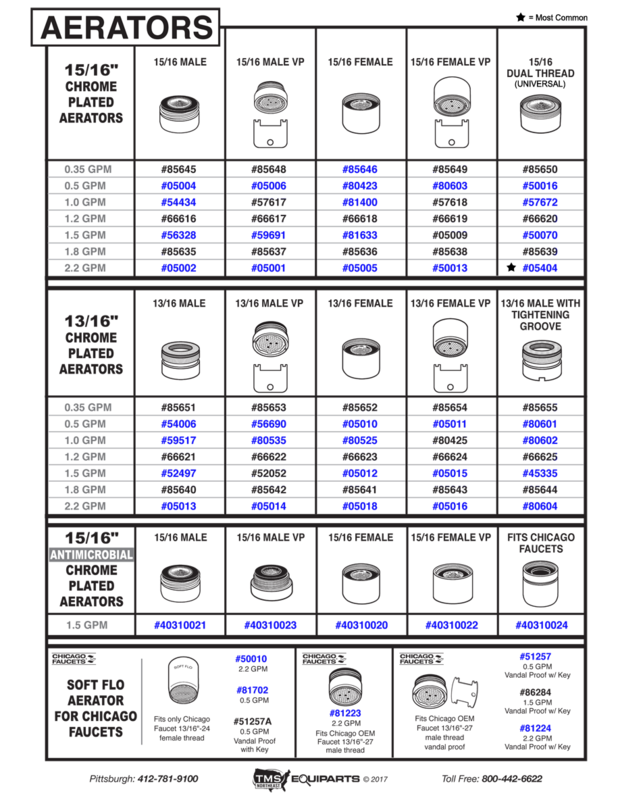 View Aerator Identification Chart. How Do I Choose an Aerator for my Faucet? There are several things to consider when selecting an aerator. GPM (gallons per minute), thread type, thread size, flow type, and style are the main factors. Different flow types include aerated, laminar, and spray. Laminar flow is recommended in hospitals and other health care facilities, and spray is used mainly in kitchen faucets. There are also vandal resistant styles available. How Do I Determine Whether I Need a Male or Female Aerator? When you see the threads on the outside of the faucet, you have a male faucet and therefore need a female aerator. If the threads are located inside of the faucet, then you need a male aerator. There is an easy trick to determining which aerator size is needed to fit your faucet, and it just involves some spare change. A dime has a diameter of .705 inches and will fit on the threads of 13/16 size aerators, which have a diameter of .8125 inches. A nickel has a diameter of .835 inches. A nickel will fit on the threads of a 15/16 size aerator, which has a diameter of .9375 inches. Is There a Universal Aerator? There is a dual aerator that has threads on both the outside and inside of the aerator. This enables the spout to fit both male and female threaded faucets. Dual thread aerators come in a variety of flow rates, from 0.35 to 2.2 GPM in 15/16” size only. 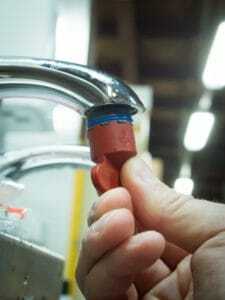 How Do I Install a Faucet Aerator? Most aerators come ready to install, but some do not. For example, when using the female threads of dual aerators, you will need to remove one of the inside washers to expose the internal threading. When Should I Replace My Aerator? 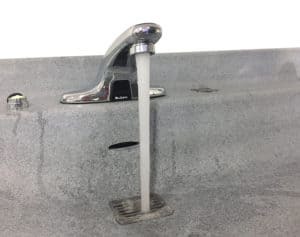 If the flow from your faucet is trickling out or only coming out of one side of the spout, then your aerator is likely clogged and needs to be either cleaned or replaced. The length of time your aerator lasts is determined by the quality of your water, how often the faucet is used, and other situational factors. How Do I Remove an Aerator? Unscrew male and female threaded aerators by turning the aerator counter clockwise. In most cases, when the aerator is not vandal resistant, you should be able to remove it with your hands. Tools will not be needed. However, if an aerator is very tight, you may need to use a non-marking wrench to remove the aerator. We recommend using a non-marking wrench because a regular wrench might mar the faucet or aerator. If the aerator spins and does not become loose when turned, then the aerator is likely vandal-resistant and requires a key for removal. If you look at the face of the aerator and you see two slots on opposite sides of the aerator, it is most likely a vandal-resistant type. The slots are where a special key is inserted in order to remove the aerator. Cache aerators also require a key for removal. How Do I Figure Out Which Aerator to Get if My Faucet Doesn’t Have One? If you are missing the aerator for your faucet, then determining the correct replacement aerator for that unit can be difficult. You can try searching with the manufacturer number of your faucet, or you can reach out to us at Equiparts to help you figure out which aerator likely fits your faucet. How Do I Unclog an Aerator? To unclog an aerator, you can soak it in vinegar and water or CLR (calcium lime remover) to remove any dirt, particles, calcium, or lime build-up. How to Reduce Splash from My Faucet Stream? Splash from your faucet can occur for a variety of reasons. Shallow or beveled basins, as well as angled faucet spouts can make splashing from the faucet stream more likely. One way to reduce or stop splash from happening is by decreasing the faucet’s flow rate. This can be done by installing an aerator with a lower GPM. • Most kitchen faucets will require a 15/16 male thread aerator with 2.2 GPM. • Most commercial faucets will fit 13/16 or 15/16 sized aerators. They will likely use vandal proof style aerators that can only be removed with a key. • Most residential faucets will use 13/16 sized aerators or smaller. • Laminar flow aerators are used primarily in hospitals because they do not mix air in with the water. • Cache Aerators, which are hidden within the head of faucets, are new style aerators that only fit in newer model faucets due to the different thread diameter they have. 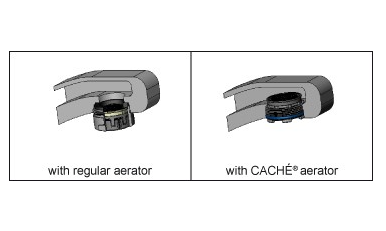 View Cache aerators or get help deciding which Cache aerators to purchase with this Cache Aerator and Kit GPM Diagram. Commercial aerators cannot be purchased at big-box stores. Vandal-resistant aerators, specialty thread aerators, and manufacturer-specific aerators are also usually not found in home improvement stores since they are designed for commercial applications. 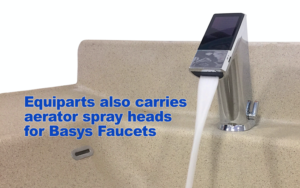 In some instances, faucets require an aerator designed specifically for that faucet or manufacturer. For example, gooseneck Chicago Faucets have a special thread that requires a specific Chicago aerator. This is also the case with Symmons and Speakman commercial faucets and aerators as well. 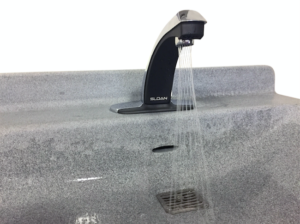 Some Kohler faucets require a specialized ⅜ IPS thread. You can find any commercial (and residential) aerator you need at Equiparts. We carry all of the most popular sizes and commercial brands, including Chicago, Sloan, Central Brass, Symmons, Moen, as well as residential faucet manufacturers like Kohler and Delta. We also have a variety of specialized aerators in stock, and we ship nationwide. Take a look at the Clickable Aerator PDF below and click through to view the aerator listing on our website. In addition to water-saving aerators, Equiparts carries many other products that are designed to reduce water consumption and make your facility more energy efficient. Order your water-saving products today by requesting a quote on our website, or by calling us toll-free at 800-442-6622 Monday-Friday, 7:30AM-5:00PM EST.